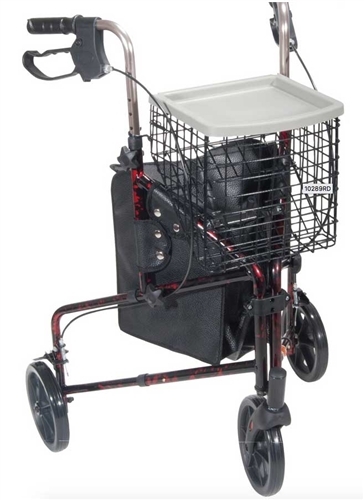 The Deluxe 3 Wheel Aluminum Rollator by Drive Medical is a red colored lightweight portable rollator. It comes standard with a basket, tray and pouch. The basket conveniently folds for easy storage. 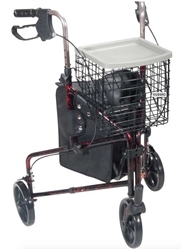 The Deluxe 3 Wheeled Rollator walker has handles that easily adjust in height with a self threading knob. The three 7” caster wheels are perfect for indoor or outdoor use. It also has loop style hand brakes for additional safety and security. The design provides easy one-handed folding for storage or transport. Even the basket folds for storage.